Carbon-supported palladium is a widely used hydrogenation catalyst. Due to the high price of palladium, highly-dispersed palladium nanoparticles are desired. Methods for the loading of Pd include deposition-precipitation, deposition-reduction, impregnation, adsorption and colloidal routes . This study focuses on deposition-precipitation and deposition-reduction for the preparation of Pd/C. A wide variety of carbon supports exists, including activated carbons and nanocarbons (e.g. carbon nanotubes and carbon nanofibers). Each support has its own properties and can be modified to include functional groups such as acid groups (O) and basic groups (N). These functional groups can function as anchoring points for Pd. The polarity and acidity/basicity have great influence in the further catalyst preparation and performance . Besides the nature of the support, lots of other variables are present in the catalyst synthesis. This project aims to find relationships between the synthesis, structure and performance by systematically studying the effects of the nature of the support, the metal precursor and the metal deposition method established. Thesis: “Co/CNT Fischer-Tropsch Catalysts: Influence of surface functionalization and impregnation solvent on structure and performance”, performed at the Inorganic Chemistry and Catalysis group, under the supervision of Dipl.-Chem. Thomas Eschemann and Prof.dr.ir. 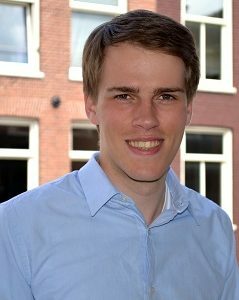 Krijn de Jong. Thesis: “Upconversion luminescence in Tm3+-doped Y2O2S”, performed at the Condensed Matter and Interfaces group, under the supervision of Dr. Rosa Martín-Rodríguez and Prof.dr. Andries Meijerink. ChemCatChem, 8 (17), pp. 2846-2852, 2016, (cited By 18). Journal of Catalysis, 328 , pp. 130-138, 2015, (cited By 41).